We celebrated a milestone on Saturday, June 17th for one of our recent projects - Kenilworth Recreation Center. 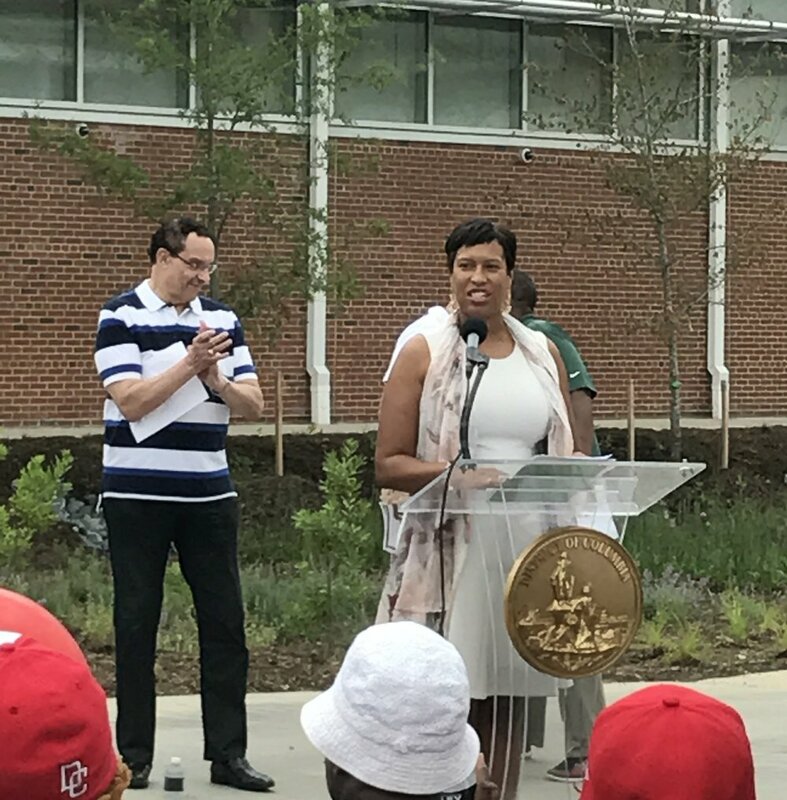 Mayor Muriel Bowser, Ward 7 Councilmember Vincent Gray and DPR Director Keith Anderson attended the ribbon cutting ceremony where they spoke of the importance of this project to the community. “The Kenilworth Recreation Center, home to DPR’s largest fitness room, largest senior lounge, largest boxing room, largest multipurpose room, and the largest, most innovative demonstration kitchen in our inventory, is the recreation center that this neighborhood deserves,” said DPR Director Anderson. Located at 1300 44th Street, NE in Ward 7’s Kenilworth neighborhood, the renovation and expansion of an old elementary school built in 1933 made way for the new 18,000 sf recreation center. This new $17 million facility offers the twenty-first outdoor pool in Washington, D.C.
“We are excited about this project because it is a continuing example of our commitment to elevating the quality of life for District residents,” said DGS Director Gillis. Targeting LEED Gold Certification, the project features an electric vehicle charging station (the first at a DPR rec center), bicycle repair station, bio-retention ‘rain gardens’ and a green roof. "The project's design and well-executed features make it possible for all of the rain water from the parking surfaces, walking surfaces and roofs to be absorbed into the ground and not the city storm line system," said Project Superintendent Eric Van Why. He continued, "It was a pleasure to work with DGS, DPR and Bell Architects because we had a great team focused on the end results." Congratulations and thanks to the project team and our interns from Phelps Architecture, Construction and Engineering High School for their hard work and dedication to deliver such a remarkable project.